Liver disease is the third most common cause of premature death in the UK, and numbers are continuing to increase. It is the only major cause of death still increasing year-on-year and kills more people than diabetes and road deaths combined. At the moment three quarters of people are diagnosed in a hospital setting when for many it is already too late. 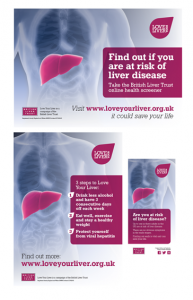 Love Your Liver is a British Liver Trust campaign to raise awareness of the risk factors of liver disease and improve early diagnosis and screening. Putting up posters or distributing leaflets. Could you put up a poster in local shops, libraries, GP waiting rooms, community centres? Are you a healthcare professional – could you put up materials in your local hospital?